Further to my Phragmipedium Bel Royal step by step posts, I promised to post about the colours and mixes used in the painting. My apologies, things got a little hectic in the last few weeks and I had to spend most of my waking moments with a brush in my hand - more about that at a later date. Now that I have a moment, I can tell you about the colours I used in the painting. Before beginning to paint, I study the plant from all angles noting the shapes and the shadows. I also note the colours and how they change. This enables me to choose the colours I will use in the painting. I prefer to use a fairly limited palette, so choosing the paints is a vital first step, as is mixing the colours to ensure I have just the right ones. 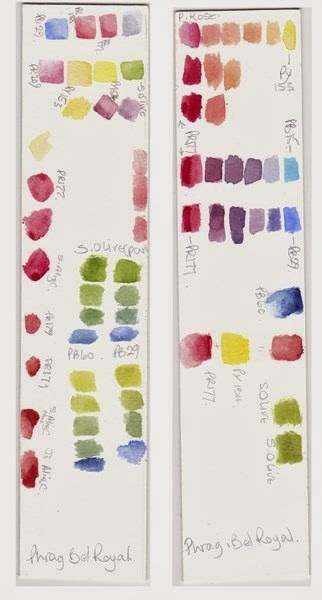 Swatches of these colours are painted on the same paper as the painting. In this painting I layered the paints in glazes, so I chose transparent colours. These paints allow the layers underneath to glow through. These are also usually staining paints, so great care is needed to only place them where they will stay - any mistakes are likely to be permanent. As you can see, these are all single pigment colours. No mud-making for me! All the colours were mixed from these, including the shadow colours which are mixed from different proportions of each of the three primaries (Yellow, Blue, Red/Pink) the warmth or coolness of the colours used will determine the type of shadow colour you get and it's possible to vary the mix to produce subtle shades of different greys. I'm fascinated by colour palettes, Polly! Thank you so much for sharing this. You're not the only one fascinated Shevaun, I am too. I have a blog post in mind that you'll really enjoy.